Olivia Perreault first became interested in art while living on a farm in Upstate New York. She moved to Greenville in 2011 after competing in the American Association of Christian Schools National Competition that is hosted here. In 2016, Olivia graduated from Indiana Wesleyan University earning her Bachelor of Science in Illustration. After graduation she was commissioned for various illustration work both locally and internationally. Through the process of exploring her own backyard, she decided to focus on painting the Southern landscape. 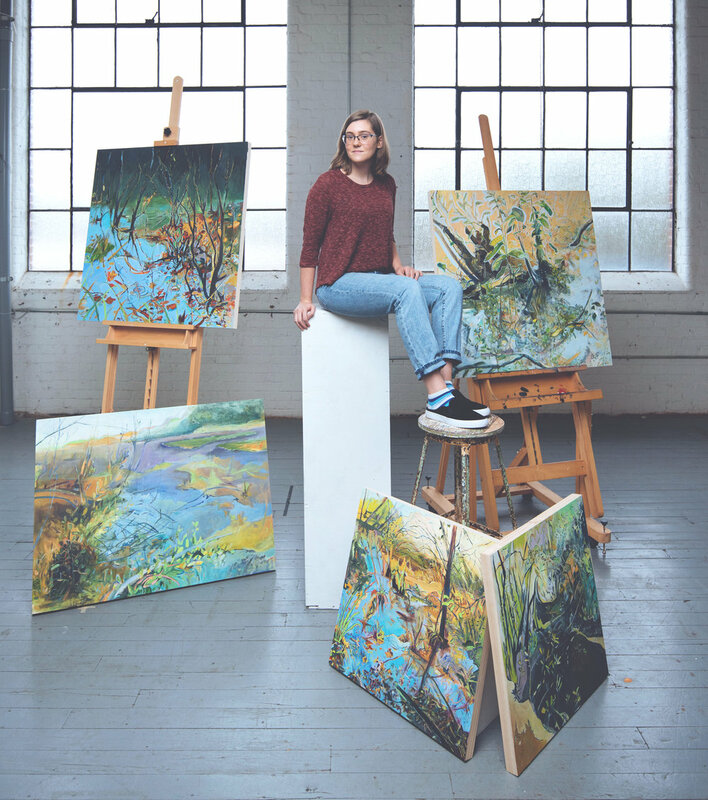 During her Brandon Fellowship tenure at Greenville Center for Creative Arts, her work has been purchased by private and corporate collectors including clients such as (the local) Iberia Bank. She has won multiple Exhibition Committee Awards during the Metropolitan Arts Council Flat Out Under Pressure Competition. Her work is currently shown at the Art Cellar, and recently has been accepted into the Emerging Artist Exhibit at Anne Irwin Fine Art. Olivia plan is to continue painting in the Greenville area. Living in the countryside has always compelled me to explore the connection that nature holds to happiness and perceptions of beauty. In my paintings, I am dedicated to capturing the excitement of seeing something for the first time. In regions where water meets land the intricacies of the flora and fungi surrounding the Southern landscape captures my particular interest. Central to my work is to convey a unique sense of mood by illustrating the ebb and flow of seasons and time of day through bold color schemes and expressive marks.